‘Tis the season for all things ghostly and frightening – and that’s not only limited to local haunted houses and corn mazes. Join us on our supernatural tour across cultures and sites to see the most bone-chillingly haunted places in Asia! Aokigahara, also known as the Sea of Trees, is a forest found in the northwestern side of Japan’s Mt. Fuji. Historically, this forest is known to contain yurei, ghosts who are unable to find a peaceful afterlife. In Japanese mythology, yurei are people who have died in a sudden and violent manner, like murder, or who died with powerful negative thoughts, such as revenge or hatred. Since the mid-1900s, over 500 people have gone to the forest and have never come back. China’s “City of Ghosts” is an incredible location to learn ancient Chinese mythology on ghosts and the afterlife. This city dates back around 2,000 years – legend says Fengdu was founded by two imperial officials, Yin Changsheng and Wang Fanqing, who escaped to the mountains of Fengdu to practice Taosim, and eventually became immortal. The combination of their names, Yinwang, means “King of the Underworld.” According to folklore, the dead must pass three tests before passing on to the afterlife. 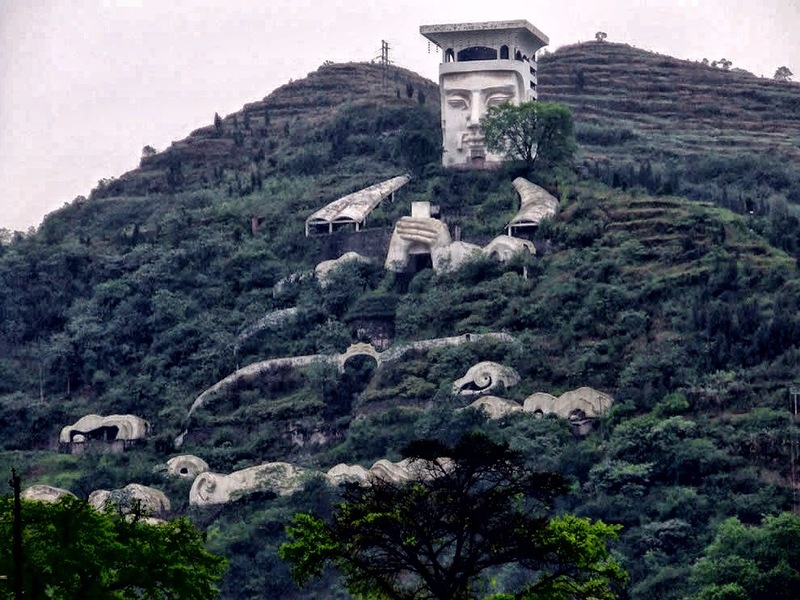 Fengdu Ghost City contains a series of shrines and temples that depict these tests – such as “The Ghost-Torturing Pass",” where souls must be judged before Yama, the King of Purgatory. The Bhangarh Fort is a 17th-century fort located in Rajasthan, India. According to legend, a priest who knew black magic fell in love with Ratnavati, an alluring princess with many suitors. The priest knew she would never favor him and decided to retort to dark spells. One day, he followed her and offered her a love potion, but she refused his advances and threw it unto a large rock, which rolled unto the wizard and crushed him to death. Before he died, the wizard set a curse to Bhangarh, saying that it would become uninhabitable for generations. Soon after, the the fort was invaded and sacked, with all the inhabitants killed. The fort still remains an abandoned rubble today – and said to be haunted by the ghosts of the priest and princess. Folk tales state that the curse will end when the princess is reborn and returns back to the fort. Shanghai’s historic Qiu mansion is home to a series of paranormal activity. The Qiu brothers were migrant workers who moved to Shanghai in the early 1900s looking for better opportunities outside the countryside. Once they arrived to Shanghai, they found a warehouse full of paint abandoned from Europeans who fled the city during WWI. As war grew, the price of paint increased and the two brothers became the wealthiest men in Shanghai. They lived a decadent life and built matching mansions that were filled with exotic pets, from Burmese tigers to peacocks. A few years later, both brothers mysteriously disappeared, never to be seen again. But the ghosts of the abandoned pets live on, angry that they were fated to die in a war-ravished city. Many visitors claim to be attacked and clawed by mysterious creatures. One worker tried to kill his boss with a hammer, professing that a “lizard-creature” forced his hand. This psychiatric facility in Gyeonggi province, South Korea, sounds straight from a horror film, with CNN claiming it as one of the freakiest places in the world. According to legend, the hospital suddenly closed in the 1990s due to a series of mysterious deaths, leaving behind tortured ghosts to haunt the abandoned hospital halls. All sorts of paranormal activity have been witnessed by trespassers, such mysterious voices and moans coming from the rooms. The Dakeng Scenic Area is a popular hiking spot for locals looking to get out of the city and soak in nature. In the late 1990s, a family hiking this area decided to bring a camcorder. Their camcorder footage shows the family together, but with a little girl in red following them in the background. Not soon after their hike, one of the sons in the video mysteriously inexplicably passes away. This story inspired the 2015 Taiwanese horror movie, The Tag-Along. Have you been to one of these places in Asia? Share with us your spooky story below!